I didn't realize this is a re-published novel. I'm glad for it though; it's the best way to introduce a great novel to a new audience. Thanks for sharing your thoughts. Thanks for the recommendation- sounds like one I will like! Interesting time to re-release this one, on the coattail's of PG's book on her mother. I like reading different takes on this whole Richard III/Elizabeth stuff, though and I'm sure this will get added to my library sooner or later. They always do, LOL. This sounds good! Thanks for the great review. I hadn't ever heard of this book, but it sounds like a great read despite the slow parts. I think I am going to add this book to my wish list and try to grab a copy. Great review, by the way. Bookshelf, I also think re-publishing is a great way for a old book to reach a new audience. 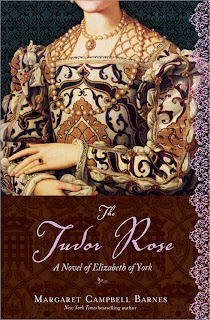 Lezlie, while the King's Fool deserved higher marks, the Tudor Rose is quite worth while. Lady Doc, you would also like the King's Fool. Michele, Stephanie, and Zibilee, I think you would enjoy this one.